A beautiful lawn isn’t a “set it and forget it” investment. Regular maintenance and attention to your lawn’s needs is key in keeping it looking lush, green and in keeping with Florida’s natural beauty. That’s where lawn fertilization services come in. Regardless of the type of turfgrass you’ve selected to use in your Florida panhandle landscape, it’s crucial to maintain a steady flow of nutrients to keep it healthy, growing and green. Why fertilize your Florida lawn? First, it needs nutrients. In order to grow into a lush, green carpet, your lawn requires nutrients such as nitrogen, potassium and phosphorous, which are present in soil, but generally not in the quantities it requires. As it grows, it uses those nutrients, and your lawn will need multiple fertilizer applications throughout the year to keep it flourishing. What’s more, proper fertilization makes your lawn stronger and more resilient. 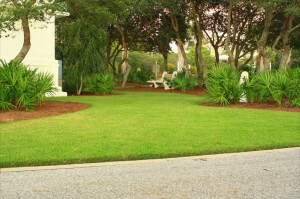 Lawn fertilization services encourage strong root growth, which lets it better absorb water and prevents puddling — especially helpful during Florida’s rainy season. Strong roots also make grass naturally resistant to weed growth, and able to recover more quickly from damage by pests and foot traffic. There’s no need to fertilize when your grass isn’t actively growing. There is such a thing as too much fertilizer. And you shouldn’t fertilize just before a heavy rain. Sound complicated? It doesn’t have to be, but there’s a delicate balance involved in fertilization! So if there’s one area of your landscape where you’re considering hiring a professional, lawn fertilization services are a great place to start. Appropriate fertilizer use is one of the keystones of Florida-Friendly Landscaping, and the lawn care professionals at GreenEarth Landscape Services excel at expert fertilization to keep our clients’ landscapes looking lush and healthy — while remaining conscious of natural resources.